Small metros with large shares of workers in blue-collar manufacturing and service jobs are likely to be hit harder. Robots and automation promise to fundamentally transform our economy and society. 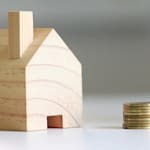 The fear is that even as they liberate us from dangerous tasks at work and drudgery at home, they will eliminate most of the high-paying manufacturing jobs we have left today. Canada and its metro areas, like most advanced countries, have already suffered a massive loss of good, family-supporting manufacturing jobs. Back in the 1970s, almost a fifth of Canadians were employed in manufacturing, today less than 10 per cent are. The reality is that the new era of robots — and automation and computerization more generally — will not only likely lead to further losses of manufacturing jobs, but will hit hardest at the even larger number of routine service jobs which currently employ 6.3 million Canadians, 40 per cent of the workforce. Indeed, the jobs most at risk from future automation are not in manufacturing, but routine service positions like waiters and bartenders, taxi and limousine drivers, and retail jobs in clothing stores, department stores, sporting goods and musical instrument shops, and jobs in the motion picture and video industries. 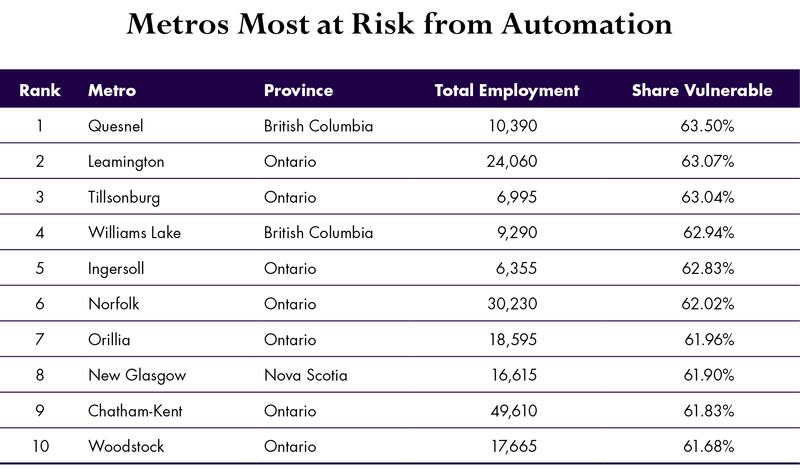 But which of Canada's cities and metros face the greatest risk from robots and automation? New Martin Prosperity Institute research conducted in collaboration with our colleague Shade Shutters of Arizona State University uses detailed occupational data from Statistics Canada's 2011 National Household Survey to identify the types of jobs most at risk from automation across Canada's 149 metros. The dark purple circles on the map indicate the share of the population whose jobs are most at risk of automation; the larger the circle, the greater the risk. The places where automation poses the greater risk to jobs are all smaller metros with between 6,000 and 50,000 total jobs. They are mainly concentrated in the manufacturing hub of southern Ontario, where seven of the 10 metros most at risk are located in this region. Conversely, topping the list is Ottawa-Gatineau, which is one of Canada's most advanced knowledge economies with a large percentage of college grads and a large share of people employed in knowledge and professional jobs. Petawawa, Ont., home to a major Canadian military base, is next, followed by Kingston, Ont., home to Queen's University. Rimouski, Que. and St. John's, Nfld. round out the top five. Victoria, B.C. (a provincial capital and home to the University of Victoria is sixth. Lacombe, Alta., is seventh followed by Cape Breton, N.S., Fredericton, N.B., and Montreal. 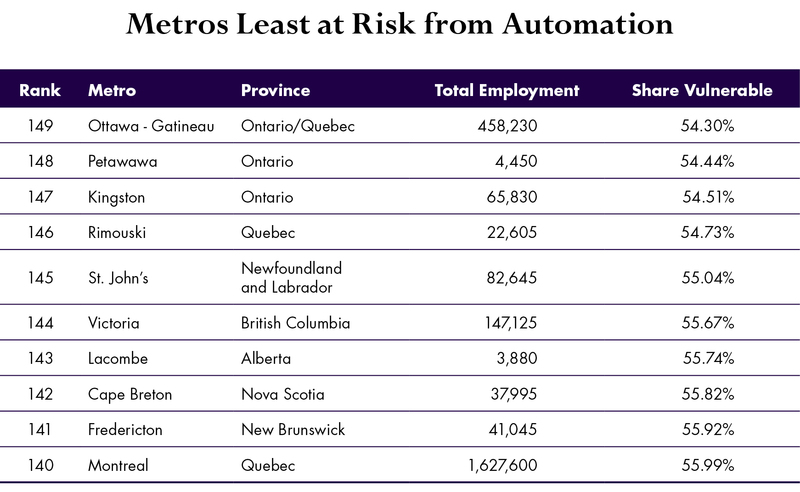 Indeed, most larger Canadian metros face a lower risk from automation. In addition to Ottawa and Montreal, which number among the 10 metros least at risk, Toronto ranks 108 (57.9 percent), Vancouver 119 (57.3 percent), Calgary 132 (56.5 percent), and Edmonton, 120 (57.3 percent). At the end of the day, the risks from automation fall most heavily on small metros with large shares of workers in blue-collar manufacturing and service jobs. 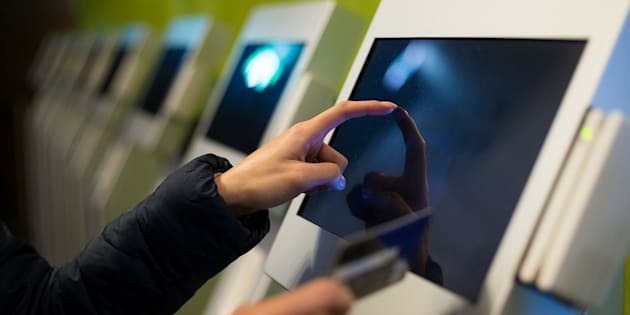 Larger, denser cities and metros with more educated populations and greater shares of knowledge, professional, management, technology and creative jobs are far better poised to cope with automation. The previous era of automation and "robot shock" struck manufacturing workers and communities hardest. But the next wave promises to hit more vulnerable places and lower-paid service workers in particular. Unfortunately, automation — and the risk of job loss that comes with it — is just one more factor reflecting the deepening spatial inequality dividing the country, hitting hardest at the most vulnerable groups in the least advantaged places.